GfK GeoMarketings new 2011 postcode and administrative maps for Germany, Austria and Switzerland are now available. The maps contain the more than 370 boundary changes that have occurred over the course of last year in the three German-speaking countries. 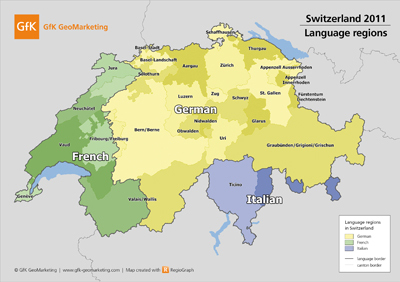 GfK GeoMarketing has released newly updated digital maps for Germany, Austria and Switzerland. These maps provide comprehensive, detailed cartographic coverage of the postcode and administrative boundaries as well as topographic information. Digital maps of postcode boundaries (e.g., 5-digit postcodes in Germany) and administrative boundaries (e.g., states, districts and municipalities) comprise the foundation for software-based analyses of data with a place-based component. A reliable and up-to-date cartographic basis is essential for all analyses and planning endeavors in geomarketing, or the regional optimization of company operations in sales, marketing, controlling and expansion planning. Up-to-date maps are indispensable, because outdated boundaries lead to errors when performing analyses with the software. Only up-to-date maps ensure that customer data is correctly imported and serve as a successful basis for further analysis. Up-to-date maps are also necessary for correctly importing and analyzing regional company turnover figures and external data on potential such as purchasing power. Since 2010, there have been more than 370 boundary changes in Germany, Austria and Switzerland due to postal and administrative reforms. The approximately 100 maps contained in the new Germany, Austria, Switzerland Map Edition 2011 incorporate these changes and reflect the latest boundaries. Germany: changes to 263 municipalities: 188 municipalities were dissolved, 8 newly created; there were changes to boundaries in 189 municipalities due to annexations and neighborhood redistricting; 10 municipalities were given new names, 3 municipalities received new identifier numbers; there were boundary changes to 4 rural districts and 1 name change. Austria: changes to 5 municipalities: 4 name changes, 1 boundary correction. Switzerland: canton reform in Canton Thurgau, which was divided into 5 cantons; changes to the boundary between the Lugano and Bellinzona cantons; 52 municipalities were dissolved, 7 were newly created and there were boundary changes among 9 municipalities. Germany: numerous changes to the 5-digit postcodes (e.g., 13 dissolutions, 2 new postcodes, boundary changes due to neighborhood redistricting). Austria: 10 new 4-digit postcodes, 1 dissolution, 1 name change and boundary changes due to neighborhood redistricting. The maps of all countries have been digitized on the basis of the latest data sources, especially official boundary data and satellite imagery. The accuracy of the digital maps corresponds to a conventional map scale of at least 1:20,000. Many regions offer an even higher level of detail. These high-quality maps provide comprehensive coverage, seamlessly fitting and overlap-free boundaries, complete local and national attributions and infinite zoom capability. As in the case of all maps from GfK GeoMarketing, the new GfK Germany, Austria and Switzerland map editions are available in all standard map formats such as *.shp (ESRI), *.tab/*.mid/*.mif (MapInfo), *.gdb (GeoDatabase) and *.lay (GfK GeoMarketing). The maps are also available in the Oracle (Spatial) database format for use in Oracle Business Intelligence applications. The new digital maps are available directly from GfK GeoMarketing. The maps of the three countries along with corresponding up-to-date GfK purchasing power data are standard components of the new geomarketing software solution, RegioGraph 2011.
at +49 (0)7251 9295145 or Email Contact. GfK GeoMarketing is a subsidiary of the globally active GfK Group. Ranked fourth among the world's market research institutes, the GfK is represented in 100 countries with over 150 subsidiaries and approximately 10,000 employees.